"Give him alms, woman, in life there is nothing like the pain of being blind in Granada"
Once the residence of the Muslim rulers of Granada and their court, the Alhambra is now one of Spain's major tourist attractions exhibiting the country's most famous Islamic architecture, together with Christian 16th century and later interventions in buildings and gardens that marked its image as it can be seen today. Within the Alhambra, the Palace of Charles V was erected by Charles V, Holy Roman Emperor in 1527. The Alhambra (from Arabic "Al-Hamra", literally "the red one"; the complete name was "al-Qal'at al-Hamra" = "the red fortress") is a palace and fortress complex of the Moorish rulers of Granada in southern Spain (known as Al-Andalus when the fortress was constructed during the mid 14th century), occupying a hilly terrace on the southeastern border of the city of Granada. The terrace or plateau where the Alhambra sits measures about 740 m (2430 ft) in length by 205 m (674 ft) at its greatest width. It extends from WNW to ESE and covers an area of about 142,000 m². Its most westerly feature is the alcazaba (citadel); a strongly fortified position. The rest of the plateau comprises a number of palaces, enclosed by a relatively weak fortified wall, with thirteen towers, some defensive and some providing vistas for the inhabitants. The river Darro passes through a ravine on the north and divides the plateau from the Albaicín district of Granada. Similarly, the Assabica valley, containing the Alhambra Park on the west and south, and, beyond this valley, the almost parallel ridge of Monte Mauror, separate it from the Antequeruela district. 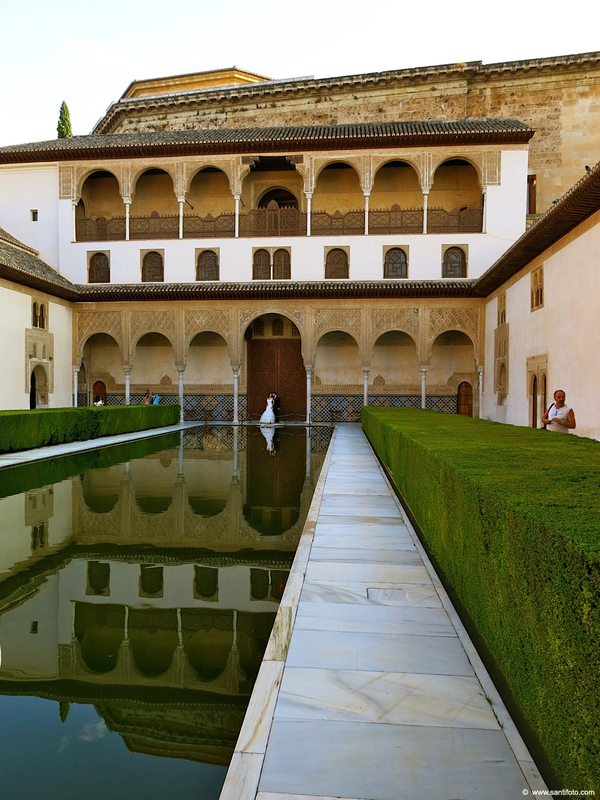 Completed towards the end of Muslim rule in Spain by Yusuf I (1333-1353) and Muhammed V, Sultan of Granada (1353-1391), the Alhambra is a reflection of the culture of the last days of the Nasrid emirate of Granada. It is a place where artists and intellectuals had taken refuge as Christian Spain won victories over Al Andalus. The Alhambra mixes natural elements with man-made ones, and is a testament to the skill of Muslim craftsmen of that time. The literal translation of Alhambra "red fortress" derives from the color of the red clay of the surroundings of which the fort is made. The buildings of the Alhambra were originally whitewashed; however, the buildings now seen today are reddish. The first reference to the Qal’at al Hamra was during the battles between the Arabs and the Muladies during the rule of the ‘Abdullah ibn Muhammad (r. 888-912). In one particularly fierce and bloody skirmish, the Muladies soundly defeated the Arabs, who were then forced to take shelter in a primitive red castle located in the province of Elvira, presently located in Granada. According to surviving documents from the era, the red castle was quite small, and its walls were not capable of deterring an army intent on conquering. The castle was then largely ignored until the eleventh century, when its ruins were renovated and rebuilt by Samuel ibn Naghralla, vizier to the King Badis of the Zirid Dynasty, in an attempt to preserve the small Jewish settlement also located on the Sabikah hill. However, evidence from Arab texts indicates that the fortress was easily penetrated and that the actual Alhambra that survives today was built during the Nasrid Dynasty. Ibn Nasr, the founder of the Nasrid Dynasty, was forced to flee to Jaén in order to avoid persecution by King Ferdinand and his supporters during attempts to rid Spain of Moorish Dominion. 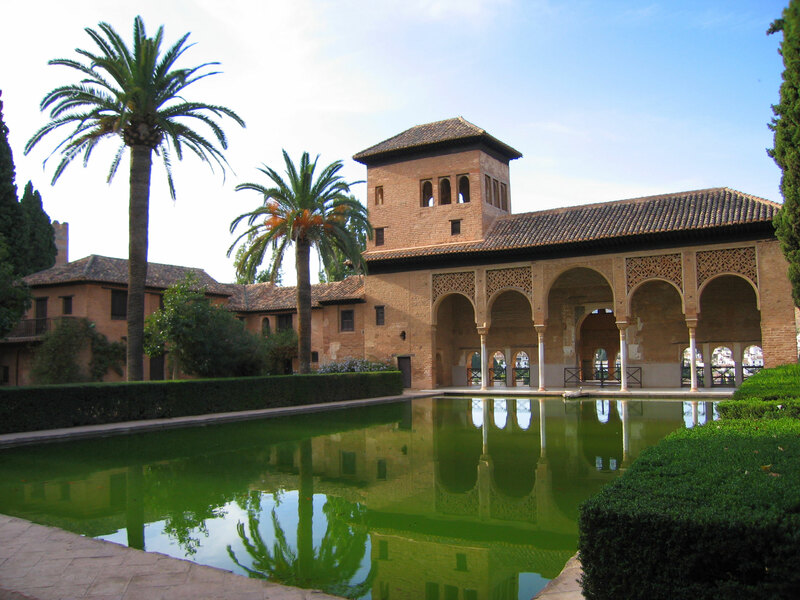 After retreating to Granada, Ibn-Nasr took up residence at the Palace of Badis in the Alhambra. 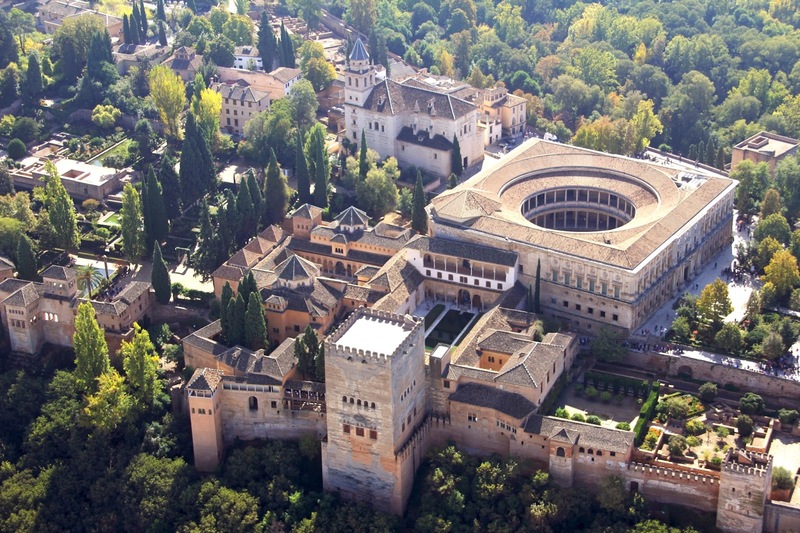 A few months later, he embarked on the construction of a new Alhambra fit for the residence of a king. According to an Arab manuscript published as the Anónimo de Granada y Copenhague, "This year 1238 Abdallah ibn al-Ahmar climbed to the place called "the Alhambra" inspected it, laid out the foundations of a castle and left someone in charge of its construction…" The design included plans for six palaces, five of which were grouped in the northeast quadrant forming a royal quarter, two circuit towers, and numerous bathhouses. 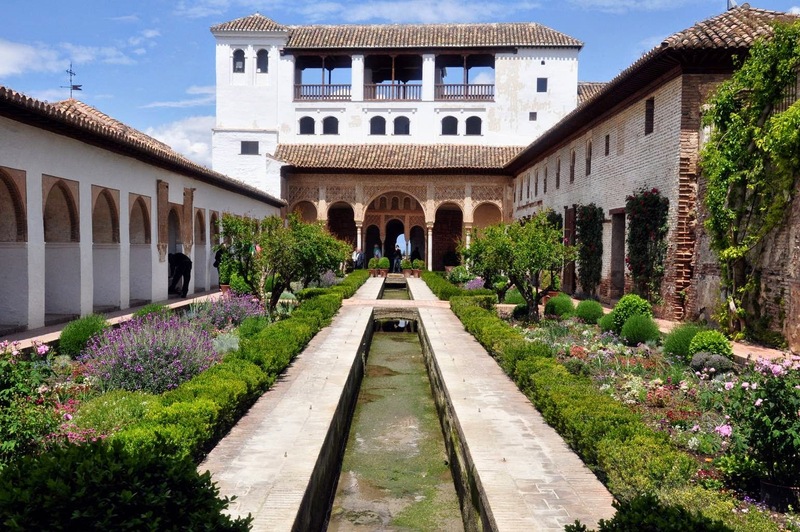 During the reign of the Nasrid Dynasty, the Alhambra was transformed into a palatine city complete with an irrigation system composed of acequias for the gardens of the Generalife located outside the fortress. Previously, the old Alhambra structure had been dependent upon rainwater collected from a cistern and from what could be brought up from the Albaicín. The creation of the Sultan's Canal solidified the identity of the Alhambra as a palace-city rather than a defensive and ascetic structure. The Muslim rulers lost Granada and Alhambra in 1492 without the fortress itself being attacked when King Ferdinand II of Aragon and Queen Isabella of Castile took the region with an overwhelming force of numbers. A room of the palace and a view of the Court of the Lions.The decorations within the palaces typified the remains of Moorish dominion within Spain and ushered in the last great period of Andalusian art in Granada. With little influence from the Islamic mainland, artists endlessly reproduced the same forms and trends, creating a new style that developed over the course of the Nasrid Dynasty. The Nasrids used freely all the display of stylistical resorts that had been created and developed during eight centuries of Muslim rule in the Peninsula as the Calliphal horse-shoe arch, the Almohad sebka or the Almoravid palm, and unused combinations of them, beside novelties as the stilted arches and the capitals of muqarnas, among others. The isolation with the rest of the Islam, and the commercial and political relationship with the Christian kingdoms also influenced in the space concepts. Columns, muqarnas and stalactite-like ceiling decorations, appear in several chambers, and the interiors of numerous palaces are decorated with arabesques and calligraphy. 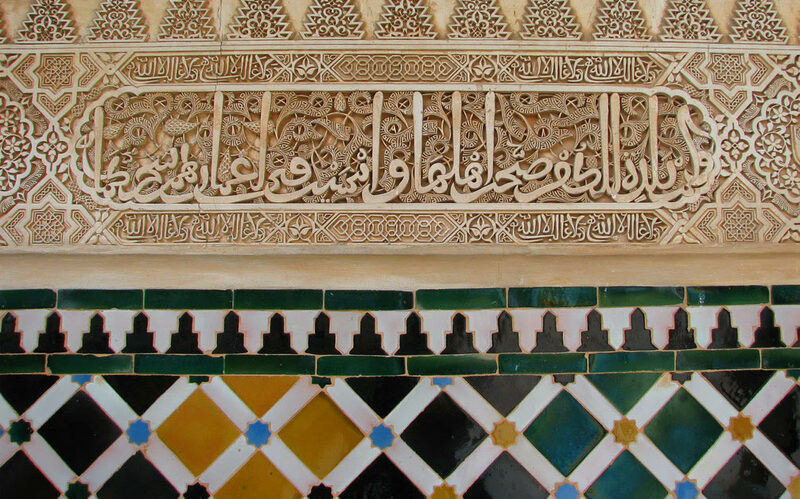 The arabesques of the interior are ascribed, among other kings, to Yusef I, Mohammed V, and Ismail I. Damage produced in Later Era After the Christian conquest of the city in 1492, the conquerors began to alter the Alhambra. The open work was filled up with whitewash, the painting and gilding effaced, and the furniture soiled, torn, or removed. Charles V (1516–1556) rebuilt portions in the Renaissance style of the period and destroyed the greater part of the winter palace to make room for a Renaissance-style structure which has never been completed. Philip V (1700–1746) Italianised the rooms and completed his palace in the middle of what had been the Moorish building; he had partitions constructed which blocked up whole apartments. Over subsequent centuries the Moorish art was further damaged, and, in 1812, some of the towers were destroyed by the French under Count Sebastiani. In 1821, an earthquake caused further damage. The work of restoration undertaken in 1828 by the architect José Contreras was endowed in 1830 by Ferdinand VII; and after the death of Contreras in 1847, it was continued with fair success by his son Rafael (d. 1890) and his grandson. 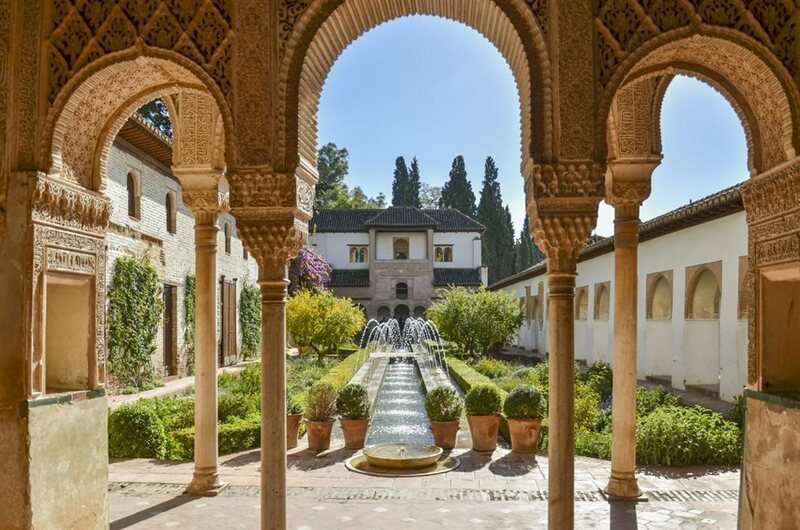 Designed to reflect the very beauty of Paradise itself, the Alhambra is made up of gardens, fountains, streams, a palace, and a mosque, all within an imposing fortress wall, flanked by 13 massive towers. Moorish poets described it as "a pearl set in emeralds," in allusion to the colour of its buildings and the woods around them. The palace complex was designed with the mountainous site in mind and many forms of technology were considered. The park (Alameda de la Alhambra), which is overgrown with wildflowers and grass in the spring, was planted by the Moors with roses, oranges and myrtles; its most characteristic feature, however, is the dense wood of English elms brought by the Duke of Wellington in 1812. The park has a multitude nightingales and is usually filled with the sound of running water from several fountains and cascades. These are supplied through a conduit 8 km (5 miles) long, which is connected with the Darro at the monastery of Jesus del Valle, above Granada. In spite of the long neglect, willful vandalism and sometimes ill-judged restoration which the Alhambra has endured, it remains an atypical example of Muslim art in its final European stages, relatively uninfluenced by the direct Byzantine influences found in the Mezquita of Córdoba. The majority of the palace buildings are, in ground-plan, quadrangular, with all the rooms opening on to a central court; and the whole reached its present size simply by the gradual addition of new quadrangles, designed on the same principle, though varying in dimensions, and connected with each other by smaller rooms and passages. Alhambra was added onto by the different Muslim rulers who lived in the complex. However, each new section that was added followed the consistent theme of "paradise on earth." Column arcades, fountains with running water, and reflecting pools were used to make add to the aesthetic and functional complexity. In every case, the exterior is left plain and austere. Sun and wind are freely admitted. Blue, red, and a golden yellow, all somewhat faded through lapse of time and exposure, are the colours chiefly employed. The decoration consists, as a rule, of stiff, conventional foliage, Arabic inscriptions, and geometrical patterns wrought into arabesques. Painted tiles are largely used as panelling for the walls. 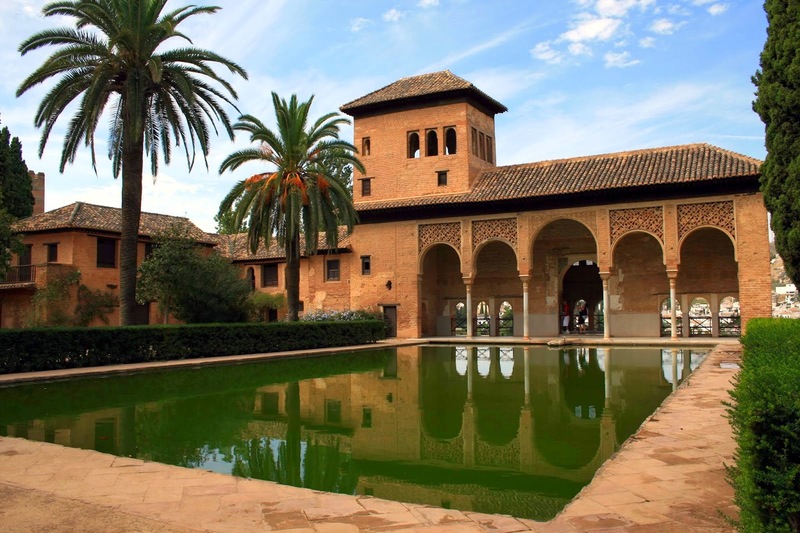 The palace complex is designed in the Mudéjar style which is characteristic of western elements reinterpreted into Islamic forms and largely popular during the Reconquista, a period of history in which the Christian kings reconquered Spain from the Muslims. The Alhambra resembles many medieval Christian strongholds in its threefold arrangement as a castle, a palace and a residential annex for subordinates. The alcazaba or citadel, its oldest part, is built on the isolated and precipitous foreland which terminates the plateau on the northwest. That is all massive outer walls, towers and ramparts are left. On its watchtower, the Torre de la Vela, 25 m (85 ft) high, the flag of Ferdinand and Isabella was first raised, in token of the Spanish conquest of Granada on January 2, 1492. A turret containing a large bell was added in the 18th century and restored after being damaged by lightning in 1881. Beyond the Alcazaba is the palace of the Moorish rulers, or Alhambra properly so-called; and beyond this, again, is the Alhambra Alta (Upper Alhambra), originally tenanted by officials and courtiers. 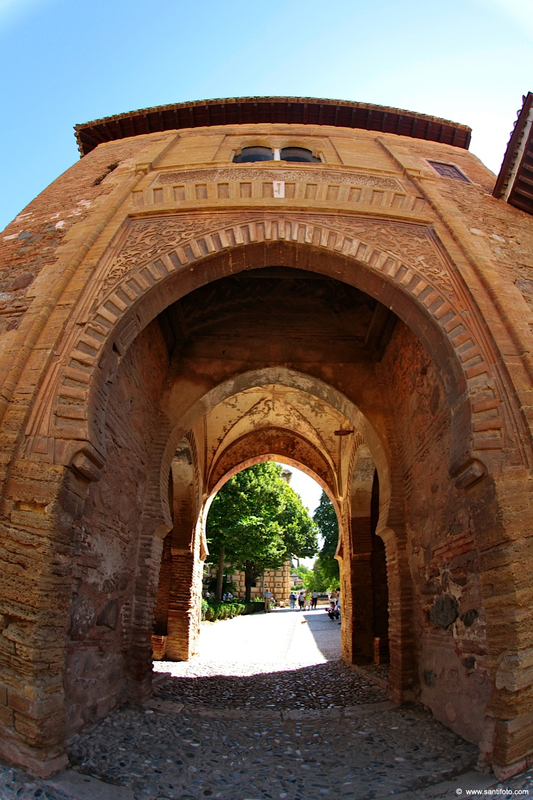 Access from the city to the Alhambra Park is afforded by the Puerta de las Granadas (Gate of Pomegranates), a triumphal arch dating from the 15th century. A steep ascent leads past the Pillar of Charles V, a fountain erected in 1554, to the main entrance of the Alhambra. This is the Puerta de la Justicia (Gate of Judgment), a massive horseshoe archway surmounted by a square tower and used by the Moors as an informal court of justice. The hand of Fatima, with fingers outstretched as a talisman against the evil eye, is carved above this gate on the exterior; a key, the symbol of authority, occupies the corresponding place on the interior. A narrow passage leads inward to the Plaza de los Aljibes (Place of the Cisterns), a broad open space which divides the Alcazaba from the Moorish palace. To the left of the passage rises the Torre del Vino (Wine Tower), built in 1345 and used in the 16th century as a cellar. On the right is the palace of Charles V, a smaller Renaissance building. The Royal Complex consists of three main parts: Mexuar, Serallo, and the Harem. The Mexuar is modest in decor and houses the functional areas for conducting business and administration. Strapwork is used to decorate the surfaces in Mexuar. The ceilings, floors, and trim are made of dark wood and are in sharp contrast to white, plaster walls. 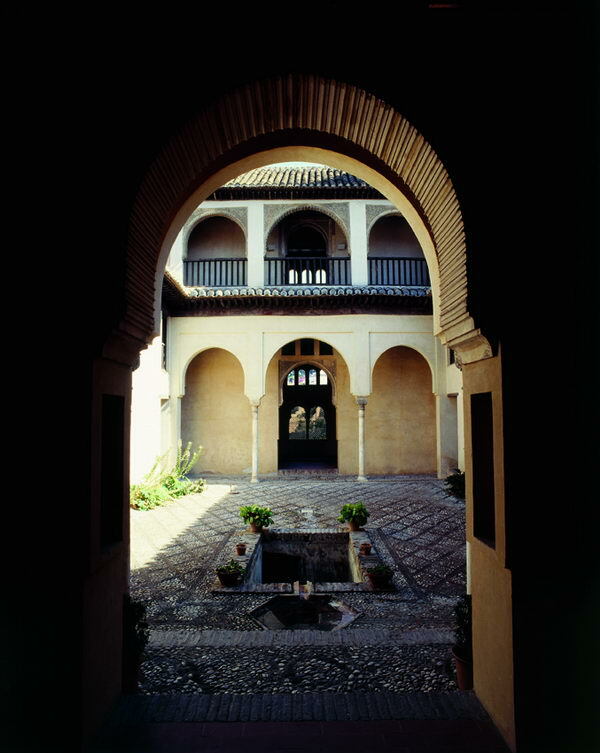 Serallo, built during the reign of Yusef I in the 14th century, contains the Patio de los Arrayanes. Brightly colored interiors featured dado panels, yesería, azulejo, cedar, and artesonado. Artesonado are highly decorative ceilings and other woodwork. Lastly, the Harem is also elaborately decorated and contains the living quarters for the wives and mistresses of the Arabic monarchs. This area contains a bathroom with running water (cold and hot), baths, and pressurized water for showering. The bathrooms were open to the elements in order to allow in light and air. The Harem also features representations of human forms, which is forbidden under Islamic law. The Christian artisans were most likely commissioned to design artwork that would be placed in the palace and the tolerant Muslim rulers allowed the work to stay. 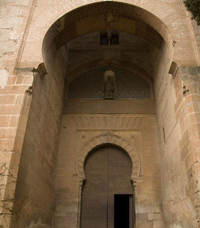 The present entrance to the Palacio Árabe, or Casa Real (Moorish palace), is by a small door from which a corridor connects to the Patio de los Arrayanes (Court of the Myrtles), also called the Patio de la Alberca (Court of the Blessing or Court of the Pond), from the Arabic birka, "pool". The birka helped to cool the palace and acted as a symbol of power. Because water was usually in short supply, the technology required to keep these pools full was expensive and difficult. The aim of the pools was to give the impression that the pool had mystical powers because it never evaporated, making them form a good opinion of their leader. This court is 42 m (140 ft) long by 22 m (74 ft) broad; and in the centre, there is a large pond set in the marble pavement, full of goldfish, and with myrtles growing along its sides. There are galleries on the north and south sides; that on the south is 7 m (27 ft) high and supported by a marble colonnade. Underneath it, to the right, was the principal entrance, and over it are three windows with arches and miniature pillars. From this court, the walls of the Torre de Comares are seen rising over the roof to the north and reflected in the pond. 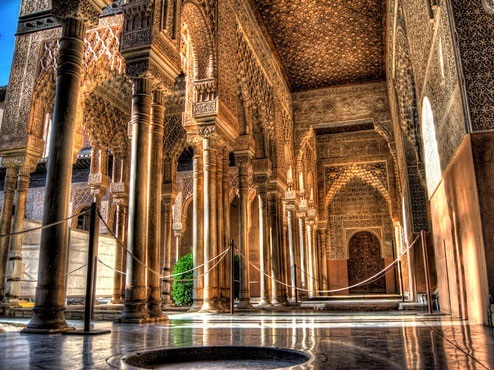 The Salón de los Embajadores (Hall of the Ambassadors) is the largest in the Alhambra and occupies all the Torre de Comares. It is a square room, the sides being 12 m (37 ft) in length, while the centre of the dome is 23 m (75 ft) high. This was the grand reception room, and the throne of the sultan was placed opposite the entrance. It was in this setting that Christopher Columbus received Isabel and Ferdinand's support to sail to the New World. The tiles are nearly 4 ft (1.2 m) high all round, and the colours vary at intervals. Over them is a series of oval medallions with inscriptions, interwoven with flowers and leaves. There are nine windows, three on each facade, and the ceiling is decorated with inlaid-work of white, blue and gold, in the shape of circles, crowns and stars. The walls are covered with varied stucco works, surrounding many ancient escutcheons. The Patio de los Leones (Court of the Lions) is an oblong court, 116 ft (35 m) in length by 66 ft (20 m) in width, surrounded by a low gallery supported on 124 white marble columns. A pavilion projects into the court at each extremity, with filigree walls and light domed roof. The square is paved with coloured tiles, and the colonnade with white marble; while the walls are covered 5 ft (1.5 m) up from the ground with blue and yellow tiles, with a border above and below enamelled blue and gold. The columns supporting the roof and gallery are irregularly placed. They are adorned by varieties of foliage, etc. ; about each arch there is a large square of arabesques; and over the pillars is another square of filigree work. In the centre of the court is the Fountain of Lions, an alabaster basin supported by the figures of twelve lions in white marble, not designed with sculptural accuracy, but as symbols of strength and courage. The Sala de los Abencerrajes (Hall of the Abencerrages) derives its name from a legend according to which the father of Boabdil, last king of Granada, having invited the chiefs of that line to a banquet, massacred them here. This room is a perfect square, with a lofty dome and trellised windows at its base. The roof is decorated in blue, brown, red and gold, and the columns supporting it spring out into the arch form in a remarkably beautiful manner. Opposite to this hall is the Sala de las dos Hermanas (Hall of the two Sisters), so-called from two white marble slabs laid as part of the pavement. These slabs measure 50 by 22 cm (15 by 7½ in). There is a fountain in the middle of this hall, and the roof —a dome honeycombed with tiny cells, all different, and said to number 5000— is an example of the so-called "stalactite vaulting" of the Moors. 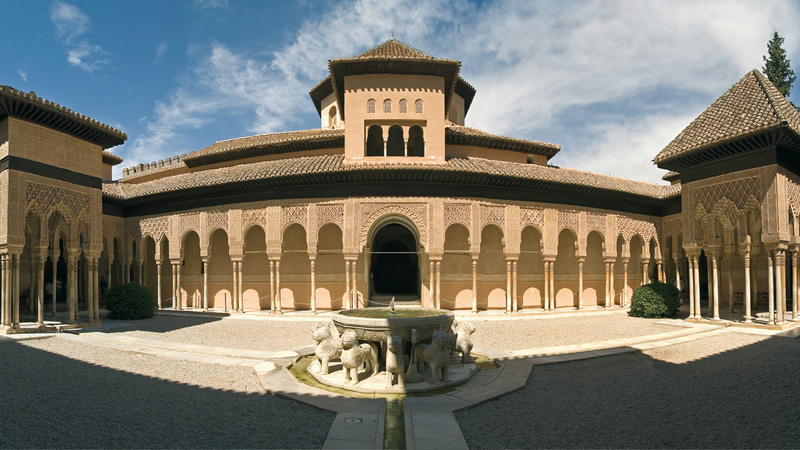 Among the other features of the Alhambra are the Sala de la Justicia (Hall of Justice), the Patio del Mexuar (Court of the Council Chamber), the Patio de Daraxa (Court of the Vestibule), and the Peinador de la Reina (Queen's Robing Room), in which there is similar architecture and decoration. 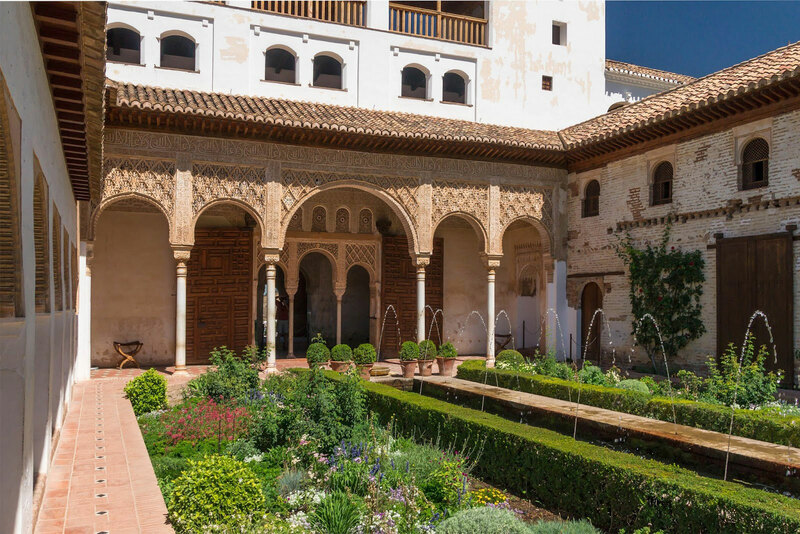 The palace and the Upper Alhambra also contain baths, ranges of bedrooms and summer-rooms, a whispering gallery and labyrinth, and vaulted sepulchres. The original furniture of the palace is represented by the vase of the Alhambra, a specimen of Moorish ceramic art, dating from 1320 and belonging to the first period of Moorish porcelain. It is 1.3 m (4 ft 3 in) high; the ground is white, and the enamelling is blue, white and gold. Whilst fountains and flowing water are a common feature around the Alhambra, they are particularly prevalent in the Palacio de Generalife.Of the outlying buildings in connection with the Alhambra, the foremost in interest is the Palacio de Generalife or Gineralife (the Muslim Jennat al Arif, "Garden of Arif," or "Garden of the Architect"). This villa probably dates from the end of the 13th century but has been restored several times. Its gardens, however, with their clipped hedges, grottos, fountains, and cypress avenues, are said to retain their original Moorish character. The Villa de los Martires (Martyrs' Villa), on the summit of Monte Mauror, commemorates by its name the Christian slaves who were forced to build the Alhambra and confined here in subterranean cells. The Torres Bermejas (Vermilion Towers), also on Monte Mauror, are a well-preserved Moorish fortification, with underground cisterns, stables, and accommodation for a garrison of 200 men. Several Roman tombs were discovered in 1829 and 1857 at the base of Monte Mauror. 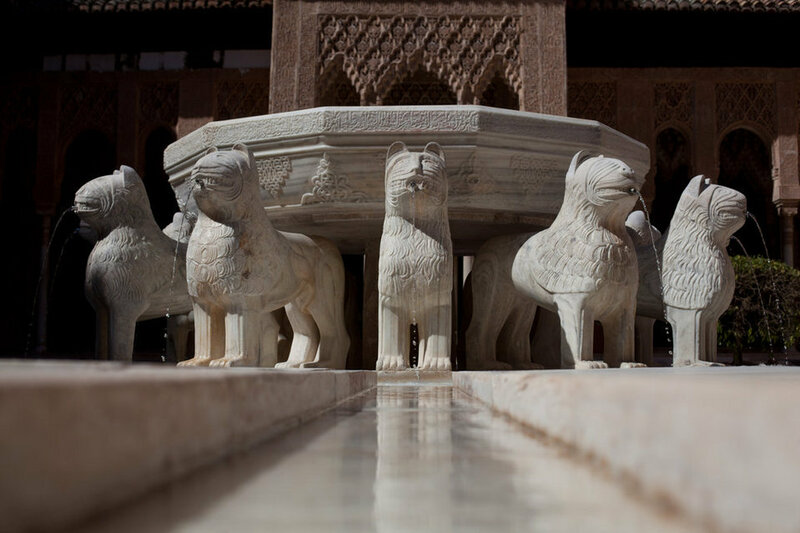 The Court of the Lions (Spanish: Patio de los Leones) is the main court of the Nasrid Palace of the Lions. It is located in the heart of the Alhambra, the Moorish citadel formed by a complex of palaces, gardens and forts in Granada, Spain. It was commissioned by the Nasrid king Muhammed V. Its construction started in the second period of his reign, between 1362 and 1391 CE. 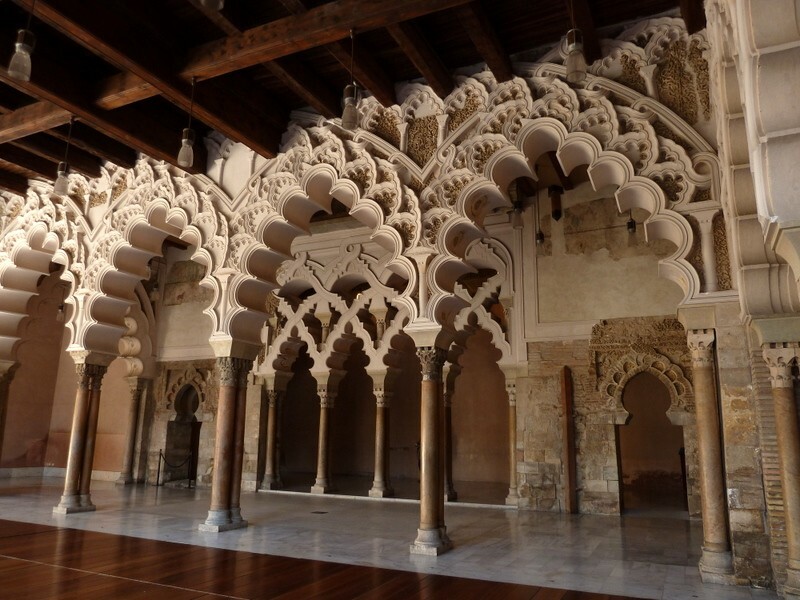 The Palace of the Lions, as well as the rest of the other new rooms built under Muhammad V, like the Mexuar or Cuarto Dorado meant the beginning of a new style, an exuberant mixture of Moorish and Christian influences that has been called Nasrid style. 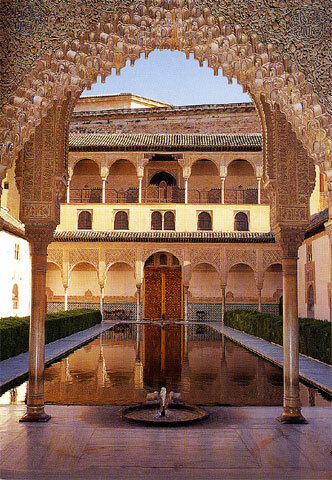 During the period that Muhammad V was ousted as sultane of Granada by his stepbrother, Abu-l Walid Ismail, he discovered in exile a host of new aesthetic influences that were not in the language of his predecessors, not even in his own first contributions to the enrichment of the Nasrid palaces of the Alhambra. 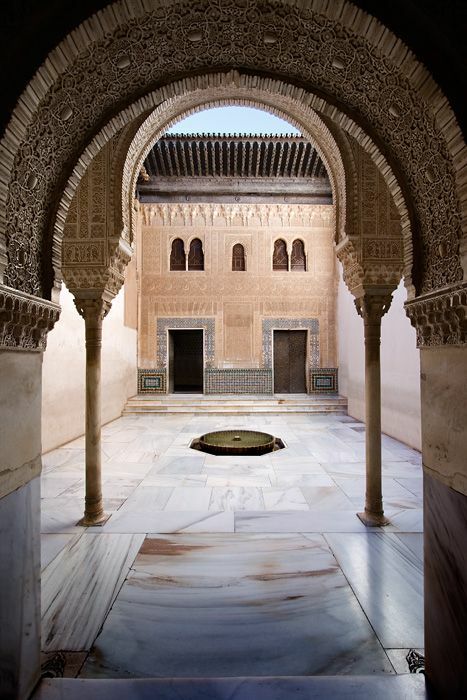 In Fes he saw the Almoravid mosque of Qarawiyyin, built by Andalusian architects. The splendor of the decorations, specially the profuse use of the muqarnas that had once decorated the palaces and mosques of Al-Ándalus, stunned the ex-sultan, as did the ruins of the Roman city of Volubilis, where he could directly examine the classical orders, Roman ornamentation and, above all, the disposition of the Roman 'impluvium'; the Roman ruins at Volubilis were particularly well preserved since they had been abandoned for a period of time in the Middle Ages and later constructively re-used as a necropolis. Muhammad became an ally of his personal friend, the Christian king Pedro I of Castile, who helped him to regain the throne and defeat the usurpers. Meanwhile, he was also astonished with the construction of the palace of Pedro I, the Alcázar of Seville, built in Mudéjar style by architects from Toledo, Seville and Granada. The influence of this Mudéjar style of King Pedro in the future Palace of the Lions was going to be decisive, especially the structure and disposition of the Qubba rooms along two axis of the 'Patio de las Doncellas' ("Court of the Maidens"). The Court of the Lions is an oblong court, 116 ft (35 m) in length by 66 ft (20 m) in width, surrounded by a low gallery supported on 124 white marble columns. A pavilion projects into the court at each extremity, with filigree walls and light domed roof, elaborately ornamented. The square is paved with coloured tiles, and the colonnade with white marble; while the walls are covered 5 ft (1.5 m) up from the ground with blue and yellow tiles, with a border above and below enamelled blue and gold. The columns supporting the roof and gallery are irregularly placed, with a view to artistic effect; and the general form of the piers, arches and pillars is most graceful. They are adorned by varieties of foliage, etc. ; about each arch there is a large square of arabesques; and over the pillars is another square of exquisite filigree work. In the center of the court is the celebrated Fountain of Lions, a magnificent alabaster basin supported by the figures of twelve lions in white marble. The structure of the court, has, as it has been said, a direct influence of the Sevillian Patio de las Doncellas, but its meaning and origins connect with the Persian roots of the Islamic gardening and its Charbagh, the court divided in four parts, each one of them symbolizing one of the four parts of the world. Each part is irrigated by a water channel that symbolize the four rivers of Paradise. This court is, therefore, an architectural materialization of Paradise, where the gardens, the water, and the columns form a conceptual and physical unity. The slender column forest have been said to represent the palm trees of an oasis in the desert, deeply related with Paradise in the Nasrid imagination. In the poem of Ibn Zamrak on the basin of the fountain, a further meaning is stated clearly: The fountain is the Sultan, which smothers with his graces all his subjects and lands, as the water wets the gardens. Nowadays the flower garden has been substituted by a dry garden of pebbles, in order not to affect the foundation of the palace with the watering. In Nasrid times, the floor of the quartered planting beds was slightly lower than the general level, and the visual effect was like a tapestry of flowers, as the top of the plants were cut to the same level of the court, and these were carefully chosen to cover a host of color nuances. The Fountain of the Lions. 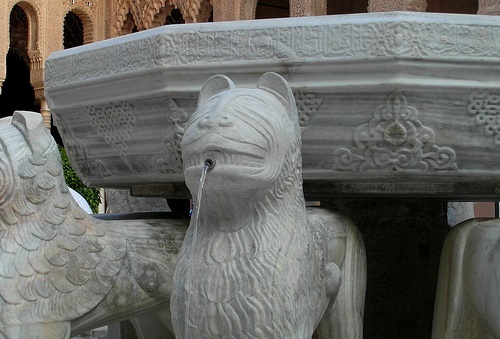 The origin and meaning of the Fountain of the Lions has generated many legends, mainly due to its unusual themes for a Muslim palace: twelve figurative lions. By the time when the palace was built the isolation from the rest of the Islam, and the relations of friendship with the Kingdom of Castile originated a two-way influence stream, and the use of figurative motifs was not strange to the Nasrid art, as seen in the paintings of the Hall of the Kings. The fountain and the lions had a model in the Fountain of the Temple of Solomon, described in the Books of Chronicles of the Old Testament The parallels are explicit in a poem of the Hispano-Hebrew Ibn Gabirol, which is a tissue of quotes and parallels of the Hebrew Bible: ....and there is a full sea, matching Solomon's sea "There is a pond, like the Sea of Solomon It doesn't rest over bulls but over lions arranged in circles: They seem to roar to their prey. Water flows from their mouth without end, it springs like the torrents of a stream. It runs to their feet through channels arranged like open drainpipes under the Sun to irrigate the bloomed parterres. Their limpid streams flood the grass They want to refresh the Garden of the Myrtles! They elevate themselves over clouds just up to the top of the trees and they scatter balsamic perfumes smelling just like the scent of the myrtles and the incense. The birds chirp on the branches, looking beneath the date palm trees. The flowers form lusty private open rooms of rose, narcissus and camphor tree scents. Their varieties are countless!" The lions were re-used, probably taken from a Cordobese Caliphal palace, where they would had been located two by two in a linear disposition. 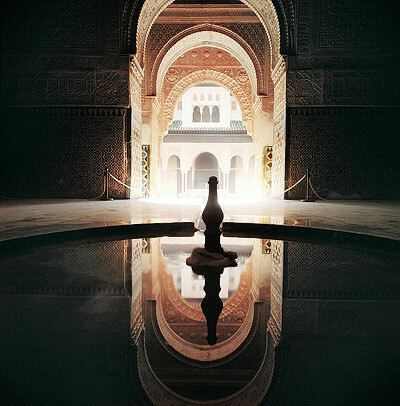 The basin was changed when Mohammed V moved the fountain to its definitive location: the poet and minister Ibn Zamrak was commanded to write a poem to describe the beauty of the courtyard. It was going to be carved around the border of the new basin. Excerpt of Ibn Zamrak's poem on the basin "...Such a translucent basin, sculpted pearl! Argentic ripples are added on it by the quiet dew And its liquid silver goes over the daisies, melted, and even purer. Hard and soft are so close, that it would be hard to distinguish liquid and solid, marble and water. Which one is running? Don't you see how water overflows the borders and the warned drains are here against it? They are like the lover who in vain tries to hide his tears from his beloved..."
The Palacio de Generalife (Arabic: Jannat al-'Arif? 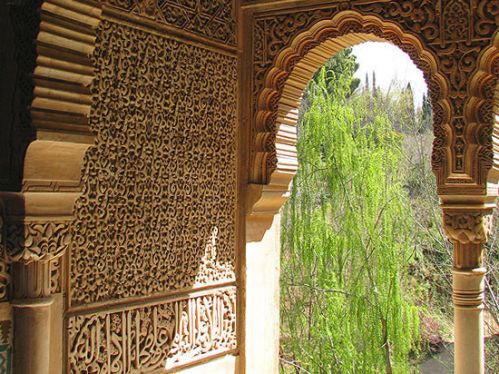 - Architect's Garden) was the summer palace and country estate of the Nasrid sultans of Granada. 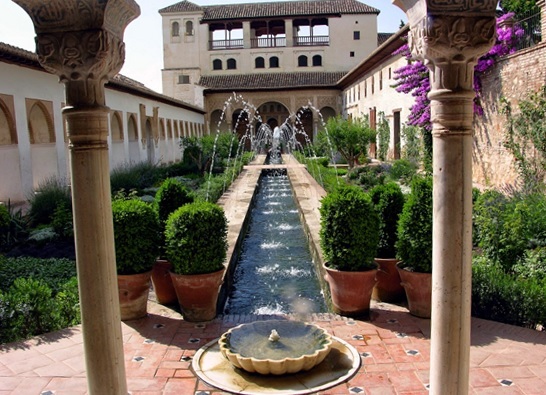 The complex consists of the Patio de la Acequia (Court of the Water Channel or Water-Garden Courtyard), which has a long pool framed by flowerbeds, fountains, colonnades and pavilions, and the Jardín de la Sultana (Sultana's Garden or Courtyard of the Cypress). 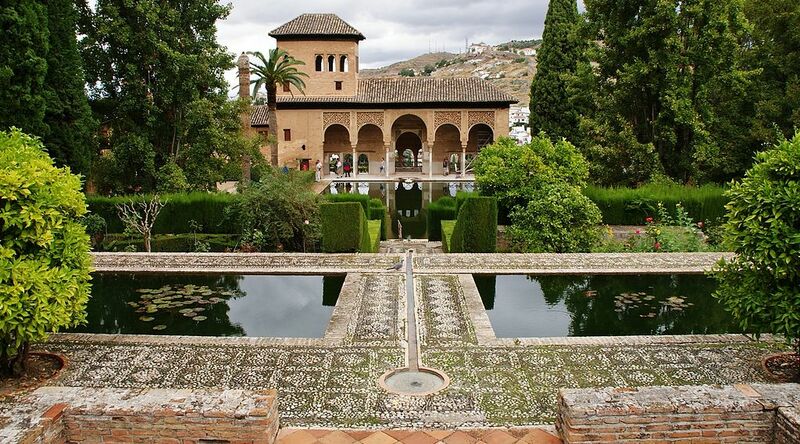 The former is thought to best preserve the style of the medieval garden in Al-Andalus. Originally the palace was linked to the Alhambra by a covered walkway across the ravine that now divides them. 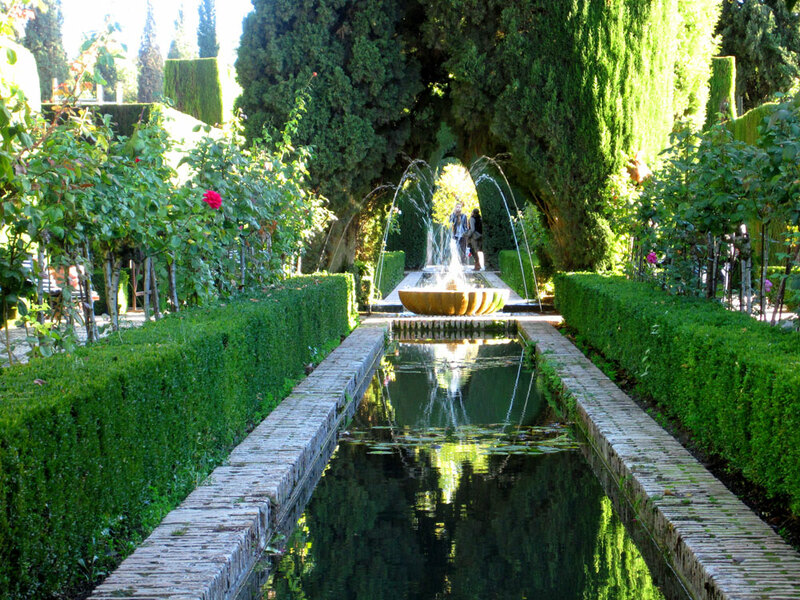 The Generalife is one of the oldest surviving Moorish gardens. The present-day gardens were started in 1931 and completed by Francisco Prieto Moreno in 1951. The walkways are paved in traditional Granadian style with a mosaic of pebbles: white ones from the River Darro and black ones from the River Genil. The city of Granada is placed at the foot of the Sierra Nevada mountains, at the confluence of three rivers, Beiro, Darro and Genil, at an elevation of 738 metres above sea level yet only one hour from the Mediterrean coast, the Costa Tropical. At the 2005 census, the population of the city of Granada proper was 236,982, and the population of the entire urban area was estimated to be 472,638, ranking as the 13th-largest urban area of the Spanish Kingdom. The Alhambra, a Moorish citadel and palace, is in Granada. It is one of the most famous items of the Islamic historical legacy that makes Granada a hot spot among cultural and tourist cities in Spain. The Almohad urbanism with some fine examples of Moorish and Morisco constructions is preserved at the part of the city called the Albaicín. Granada is also well-known within Spain due to the prestigious University of Granada and, nowadays, vibrant night-life. In fact, it is said that it is one of the three best cities for college students (the other two are Salamanca and Santiago de Compostela). The pomegranate (in Spanish, granada) is the heraldic device of Granada. The city has been inhabited from the dawn of history. There was an Ibero-Celtic settlement here, which made contact in turn with Phoenicians, Carthagenians and Greeks. By the 5th century BCE, the Greeks had established a colony which they named Elibyrge or Elybirge (Greek). Under Roman rule, in the early centuries CE, this name had become "Illiberis". As Illiberis, the city minted its own coins. The Visigoths maintained the importance of the city as a centre of both ecclesiastical and civil administration and also established it as a military stronghold. It was also managed by Byzantines for 60 years. A Jewish community established itself in what was effectively a suburb of the city, called "Gárnata" or "Gárnata al-yahud" (Granada of the Jews). It was with the help of this community that Moorish forces under Tariq ibn-Ziyad first took the city in 711, though it was not fully secured until 713. They referred to it under the Iberian name "Ilbira", the remaining Christian community calling this "Elvira", and it became the capital of a province of the Caliphate of Cordoba. Civil conflicts that wracked the Caliphate in the early eleventh century led to the destruction of the city in 1010. In the subsequent reconstruction, the suburb of Gárnata (Arabic) was incorporated in the city, and the modern name in fact derives from this. With the arrival of the Zirid dynasty in 1013, Granada became an independent emirate Taifa of Granada. By the end of the eleventh century, the city had spread across the Darro to reach what is now the site of the Alhambra. In 1228, with the departure of the Almohad prince, Idris, who left Iberia to take the Almohad leadership, the ambitious Ibn al-Ahmar established the longest lasting Muslim dynasty on the Iberian peninsula - the Nasrids. With the Reconquista in full swing after the conquest of Cordoba in 1236, the Nasrids aligned themselves with Ferdinand III of Castile, officially becoming a tributary state in 1238. The state officially became the Kingdom of Granada in 1238. Granada was held as a vassal to Castile for many decades, and provided trade links with the Muslim world, particularly the gold trade with the sub-saharan areas south of Africa. The Nasrids also provided troops for Castile while the kingdom was also a source of mercenary fighters from North Africa. On January 2, 1492, the last Muslim leader, Muhammad XII, known as Boabdil to the Spanish, surrendered complete control of Granada, to Ferdinand and Isabella, Los Reyes Católicos ("The Catholic Monarchs"), after the city was besieged. See Nasrid dynasty for a full list of the Nasrid rulers of Granada. The most prominent members of the dynasty were: • Mohammed I ibn Nasr (died 1273), the founder of the dynasty • Yusuf I (1334–1354) • Muhammed V (1354–1391), builder of the royal palace within the Alhambra • Muhammad XII of Granada, the last of the line, who surrendered in 1492 to Ferdinand and Isabel and was given the Alpujarras mountains to rule to the East of Granada, although he left for Tlemsen in Morocco. The capture of Muslim Granada by the forces of Ferdinand and Isabella is one of the more significant events in Granada's history. The terms of the surrender treaty explicitly allowed the city's Muslim inhabitants to continue unmolested in their faith and customs. By 1499, however, Cardinal Francisco Jiménez de Cisneros grew frustrated with the slow conversion efforts of Granada's first archbishop, Fernando de Talavera, and undertook a program of forced baptisms. Cisneros's new tactics, which were a direct violation of the terms of the treaty, provoked an armed revolt centered in the Alpujarras, a rural region to the southwest of the city. In response to the rebellion, in 1501 the Castilian Crown rescinded the surrender treaty, demanding that Granada's Muslims convert or emigrate. While many elites chose to emigrate to North Africa, the majority of the city's Muslims converted to Christianity while keeping their Islam secretly, becoming Moriscos, Catholics of Moorish descent. Over the course of the sixteenth century, Granada took on an ever more Christian and Castilian character, as immigrants flocked to the city from other parts of the Iberian Peninsula. The city's mosques, some of which had been established on the sites of former Christian churches, were converted to Christian uses. New structures, such as cathedral and the Chancillería, or Royal Court of Appeals, helped transform the urban landscape, and in the wake of the 1492 Alhambra decree that expelled Spain's Jewish population, Granada's Jewish neighborhood was demolished to make way for new Christian and Castilian institutions. The fall of Granada holds an important place among the many significant events that mark the latter half of the 15th century. It ended the eight hundred year-long Islamic presence in the Iberian Peninsula. Freed from internal conflict, a unified Spain embarked on its greatest phase of expansion around the globe, leading to the arrival in the Americas by Isabella's protégé Christopher Columbus. Subsequent colonization led to the creation of the Spanish Empire, the largest empire of the world for its time. Although many Muslim buildings were destroyed by the catholics, who forced convertion to catholisismduring the Christian era in Granada, those that remain comprise the most complete group of Moorish domestic architecture in Europe. Palaces like Dar al-Horra, or Alcazar Genil, or houses like the house of the Horno de Oro, the house of Chapiz, or the house of Abén Humeya, are only some of the most famous. Granada's public baths, like El Bañuelo or the Alhambra Baths, and the complex of Arab public fountains and wells (aljibes), are unique in Europe. The Nasrid infrastructure net (acequias) that feeds the public fountains and wells still functions in its majority. 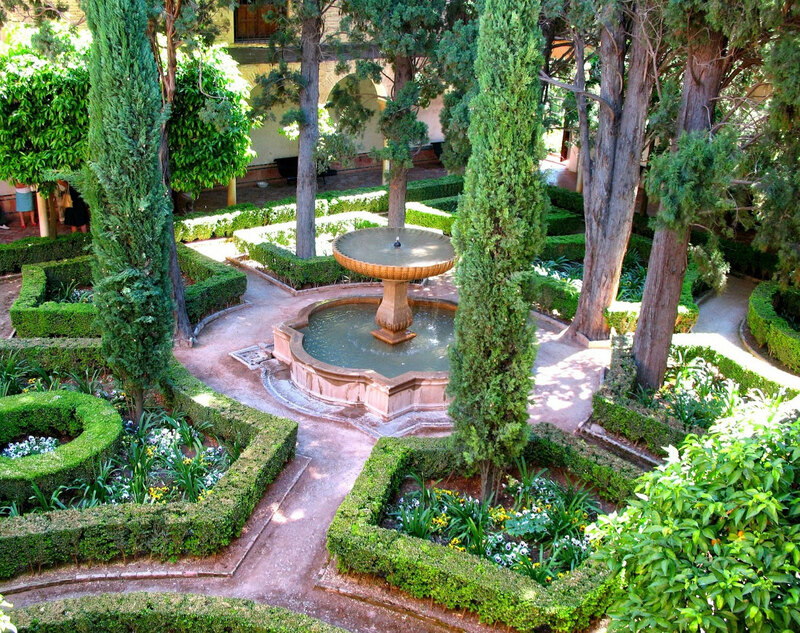 Among the best known of Granada's acequias are the Royal Acequia and the Cadí Acequia. The Realejo, was the Jewish district at the time of the Nasride Granada. The Jewish population was so important, that Granada was known from the Al-Andalûs Country under the name of Granada de los judios (in Arabic, Garnata). It´s today a district made up of many Andalusian villas, with gardens opening onto the streets, called Carmenes. The Cartuja. This district contains the Carthusian monastery of the same name: Cartuja. This is an old monastery started in a late Gothic style with Baroque exuberant interior decorations. In this district also, many buildings were created with the extension of the University of Granada. Bib-Rambla. The toponym existed at the time of the Arabs. Nowadays, Bib-Rambla is a high point for gastronomy, especially in its terraces of restaurants, open on beautiful days. The Arab bazaar (Alcaicería) is made up of several narrow streets, which start from this place and continue as far as the cathedral. The Sacromonte neighborhood is located on the extension of the hill of Albaicín, along the Darro River. This area, which became famous by the nineteenth century for its predominantly Gitano inhabitants, is characterized by cave houses, which are dug into the hillside. The area has a reputation as a major center of flamenco song and dance, including the Zambra Gitana, Andalusian dance originating in the Middle East. The zone is a protected cultural environment under the auspices of the Centro de Interpretación del Sacromonte, a cultural center dedicated to the preservation of Gitano cultural forms. The Albayzín, (also written as Albaicín), located on a hill on the right bank of the river Darro, is the ancient Moorish quarter of the city and transports the visitor to a unique world: the site of the ancient city of Elvira, so-called before the Zirid Moors renamed it Granada. It housed the artists who went up to build the palaces of Alhambra on the hill facing it. Time allowed its embellishment. Of particular note is the Plaza de San Nicolas (Plaza of St Nicholas) from where a stunning view of the Alhambra can be seen. El Albayzín is a district of present day Granada, Spain that retains the narrow winding streets of its Medieval Moorish past. 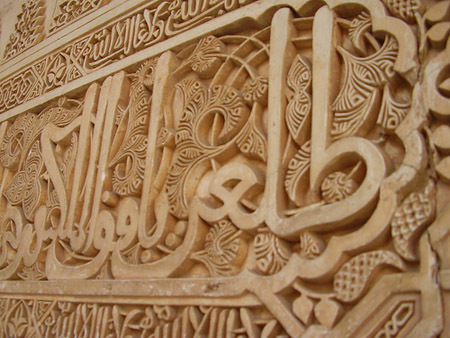 It was declared a world heritage site in 1984, along with the more famous Alhambra. It rises on a hill facing the Alhambra and many tourists journey into the Albayzin primarily for the spectactular views of the Alhambra from the viewing point by the church of San Nicolas. Highlights within the area include the remains of an Arab bath complex, Granada's archeological museum, and the church of San Salvador, built on the remains of a Moorish mosque. Albayzin also contains some original Moorish houses and a wide-range of restaurants, including several streets whose eateries are inspired by North Africa. The Zaidin. This blue collar neighborhood houses 100,000 residents of Granada, making it the largest neighborhood. Traditionally populated by gypsies, now many residents are from North and West Africa, China, and many South American countries. Every Saturday morning it hosts a large outdoor market or "mercadillo", where many gypsies come and sell their wares of fruits, vegetables, clothes, shoes, and other sorts of odds and ends.